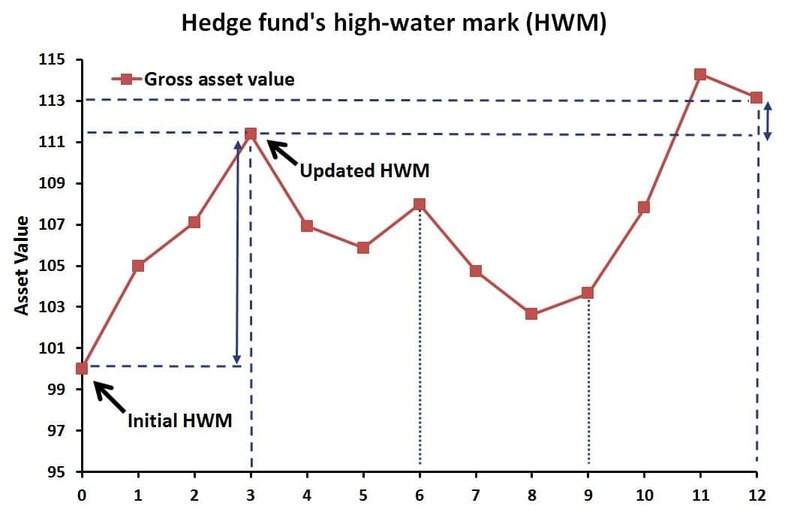 An ordinary high-water mark (HWM) clause or ‘loss carryforward’ provision typically accompanies fee structures where the fund manager is entitled to a performance fee. The high-water mark clause of a hedge fund states that the fund manager first has to recover losses before he can charge a performance fee on new profits. High-water mark clauses are a common element in the fee structure of hedge funds. The best way to get a good understanding of how the high-water mark clause works, is by looking at an example. At the bottom of this page, we provide an Excel spreadsheet that performs the necessary calculations. Let’s consider a hypothetical hedge fund called PairsTrading llc. For simplicity, let’s assume the hedge fund does not charge a management fee. Instead, the hedge fund only charges a performance fee of 20% of profits. In addition, the fund employs a high-water mark to determine the performance fees that are due. As such, investors only have to pay a performance fee on new profits. Finally, the performance fee is charged quarterly. This implies that the high-water mark will also be updated at the end of every quarter. In the following table, we report the gross returns of the fund for the a one-year period. These are the returns before fees. Investors can buy shares with a value of 100 at time 0. This initial share value will also serve as our ‘initial’ high-water mark. As we can see, during the first three months the fund performs quite well. However, after that the fund starts to lose money reaches a low at the end of month 8. Nevertheless, the fund still manages to end up above the updated high-water mark at the end of the year. The following figure plots the evolution of the fund’s asset value. The arrows indicate the cases where the fund manager is able to charge a performance fee. In these cases, the fund is above the high-water mark. Once the performance fee is charged to the investors’ account, we update the high-water mark to ‘updated HWM’. The frequency with which we update the high-water mark is called the crystallization frequency. In this case, the crystallization frequency is quarterly. Continuing the above example, we look at the asset value of the fund after 6 months. In this case, the current asset value is below the updated high-water mark (109.11 > 107.98). This implies is the manager is entitled to a performance fee. After 9 months, the manager is still below the updated high-water mark. Finally, at the end of the year, the manager is again entitled to a performance fee. He has recovered all the losses he incurred between month 3 and the end of the year. We have provide the definition of a high-water mark clause as it is commonly used by hedge funds. Next, we illustrate how an investor can calculate performance fees when a high-water mark is in place. The calculation is fairly simple and can be done using a simple Excel spreadsheet.